Are Hostas Poisonous to Cats? Don't let your furry pal near these. Some plants appear to be perfectly innocent and peaceful from the exterior, while they actually are a big hazard to household pets. 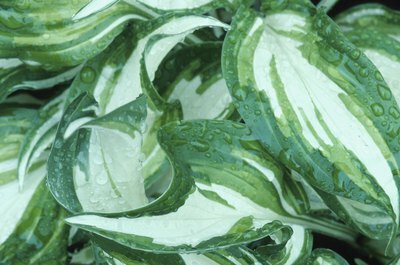 Hostas, also known as plantain lilies, are just one such example. The plants, which are appreciated for their vivid leaves, are poisonous to cats, dogs and horses. The hardy herbaceous perennials, which originated in northeastern Asia, appear in many gardens because of their striking foliage, which exist in an assortment of different colors, including bluish-green, deep green and yellowish-green. The leaves usually are shaped like hearts, straps or ovals. Circular forms also appear. The better you can identify hostas, the easier it will be for you to keep your pets away from them. The bottom line is, hostas are poisonous to cats, and because of that, it is extremely crucial for you to keep your pets away from them. The plants contain saponins, which are toxic glycosides. If your little one somehow eats any part of a hosta, she may undergo some unpleasant and hazardous effects, so do not take the risk lightly under any circumstances. Saponins are dangerous chemical compounds that may manifest themselves in a variety of symptoms. Be on alert for signs of toxicity, such as depression, vomiting and diarrhea, all of which point to hosta poisoning, so waste no time in seeking out emergency veterinary assistance for your fluff ball. If you even have the slightest inkling that your cat may have gotten her mouth on a hosta plant, veterinary attention is the way to go. Always consult an experienced veterinarian regarding the health and treatment of your pet. Unfortunately, the list of garden hazards does not begin and end with hostas. Many different plants are poisonous to cats, or any other pet for that matter, so knowledge of plant safety is a smart bet. Other than hostas, look out for harmful plants, including American hollies, hyacinths, seaside daisies, fern palms, wild carnations and taro vines. If you are unsure about an individual plant's pet safety, pose any specific questions to your veterinarian. Are Poinsettas Poisonous to Cats? Are Ferns Bad for Cats?